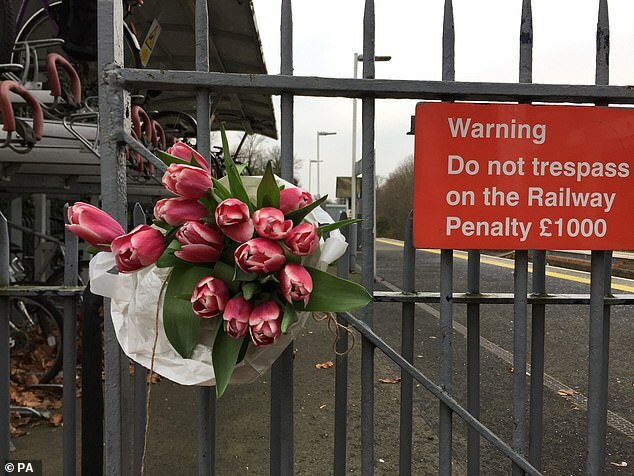 The 14-year-old boy of a man stabbed to death on a Surrey train one day before his 52nd birthday sat with his father as he lay dying in the carriage, it has emerged. 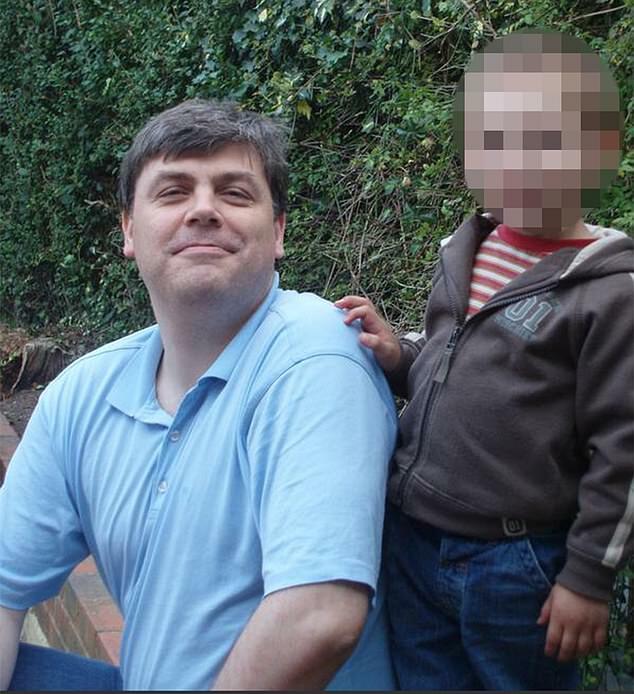 IT consultant Lee Pomeroy, 51, was knifed multiple times on a Guildford to London Waterloo train on Friday afternoon while on his way to the capital for a day out with his boy. 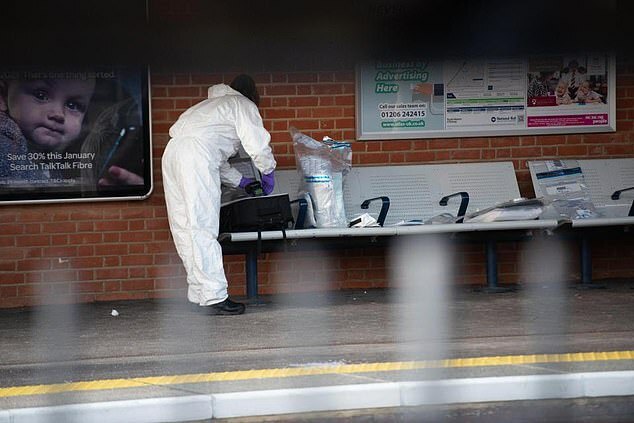 It is understood that the teenager did not witness his father being stabbed – but did move carriage to sit with him as he lay dying on the floor. The tragic sequence of events unfolded as Mr Pomeroy was with his son on the Friday lunchtime service from Guildford to Waterloo. He was somehow drawn into an argument with another passenger – a man unknown to him – who had boarded the same train. Their row lasted some three minutes, with the two men moving at one stage from carriage to carriage. It ended abruptly in a burst of what police called ‘extraordinary violence’. Mr Pomeroy, from Guildford, Surrey, was stabbed multiple times, at least once across his neck. Despite frantic efforts to keep him alive, he was pronounced dead at the scene. Mr Pomeroy’s shattered Russian wife, Svetlana, 50, a former journalist, and their son were being supported by family liaison officers. Ironically, Svetlana, who married her husband in 2001, moved to Britain from the remote Russian region of Chukotka because she considered it more ‘civilised’ than her homeland. Writing to friends on social media in 2006, she said: ‘I love how people here [in Britain] wish to be hospitable, how they smile, how they take care of nature. People still tend to build families, plus there are laws to support women.’ She told how she spoke Russian to her son, describing him as a ‘sweet boy’. 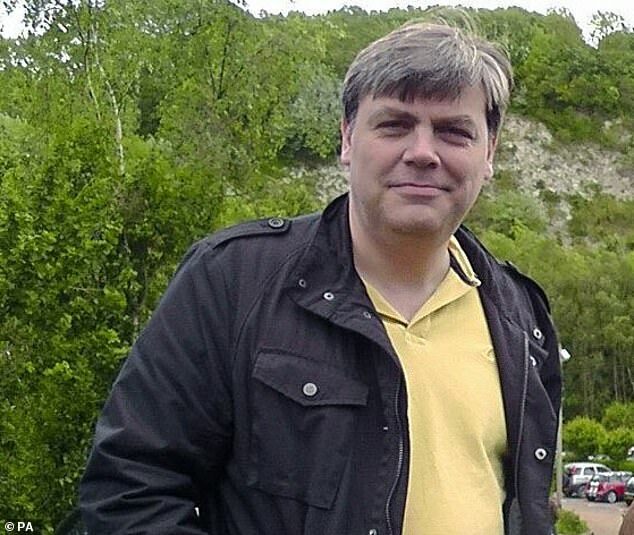 The man arrested for the murder of Mr Pomeroy is aged 35, detectives said last night. The suspect was arrested at 6am at a flat in Farnham while a woman, 27, was arrested on suspicion of assisting an offender. Both are still being questioned by police while a post mortem is set for early next week. 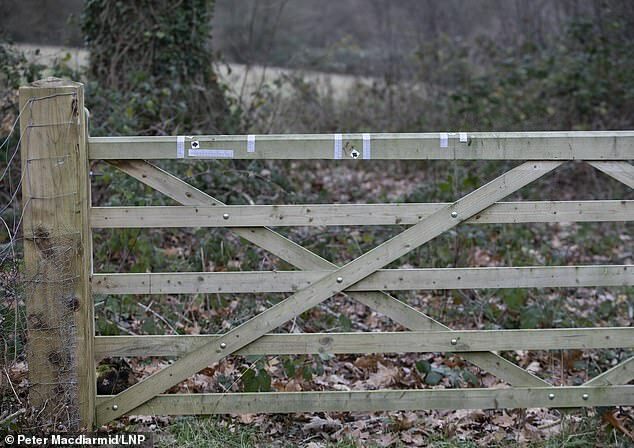 Police investigating Mr Pomeroy’s death have used a host of 21st century gadgets to help them catch the killer. 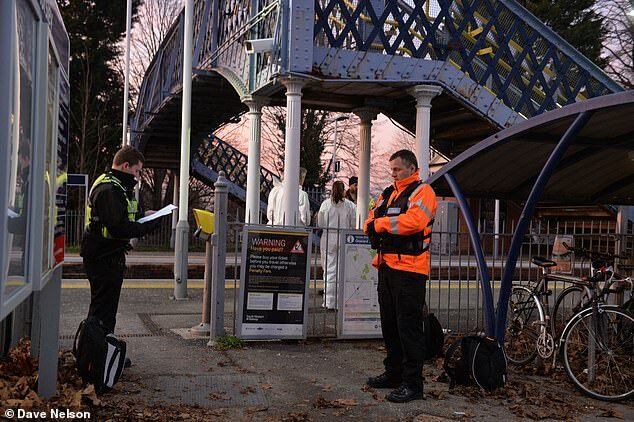 British Transport Police used ticketing data from London Road station in Guildford, CCTV footage from South Western Railway and mobile phone data from nearby masts to help track down suspects. They also deployed drones and a helicopter over the surrounding countryside, according to The Sunday Times. 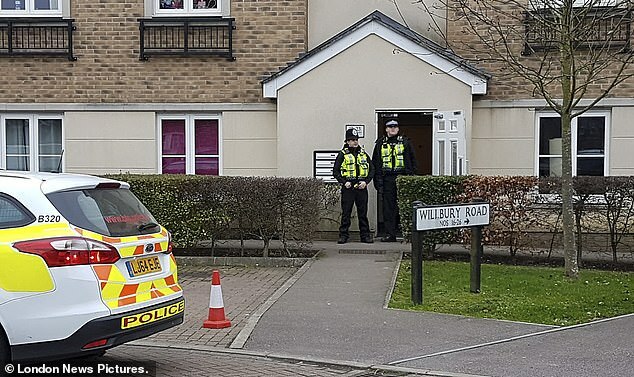 Neighbours told MailOnline ‘around 12 officers’ went into the property and shouted ‘put your hands up and turn around’ before appearing with the man and woman. 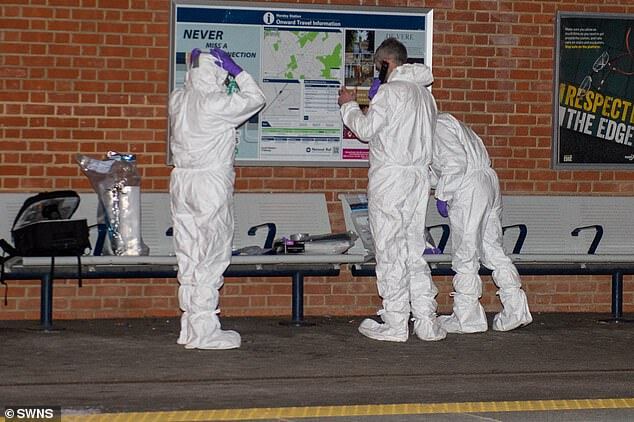 The man being held over the fatal attack is thought to have left a trail of the victim’s blood after getting off at the next stop in Clandon. 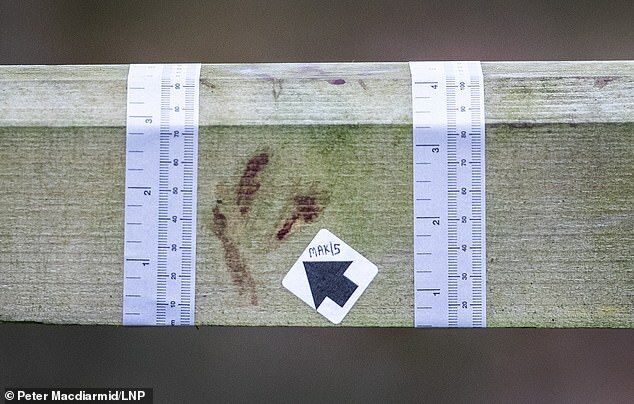 It was found smeared on a fence near the railway station. Mr Pomroy’s family said they were distraught that his life was cut short by such a ‘horrific and pointless’ attack. They described the doting father as ‘an honest, bright person, who loved music very much, knew history and art and was a bachelor of science in Maths’. ‘He was devoted family man and did everything for his family. He was an honourable man and would always help somebody who was in trouble. He was a loving husband and father, he will be deeply missed by all his family,’ a family statement read. Police are appealing for anyone with dashcam footage in the Clandon area after 1pm on Friday afternoon. Speaking yesterday afternoon, a woman in the garden of Mr Pomeroy’s home in Guildford said it was ‘too fresh’ for his wife to comment at the moment. Talking over the back gate of the pretty semi-detached house worth around £485,000, she did not reveal her relation to the family but said: ‘It is too fresh. It was in front of their 14-year-old son. A neighbour two doors down said he was ‘shocked’ to hear the victim lived on his street. Another neighbour, who did not want to be named, said: ‘It is utterly terrifying really, especially because he was with his poor child, his poor child was there. Speaking to MailOnline today, neighbours described the shocking moment the man and woman were arrested yesterday morning. Grant Christy said: ‘The raid began at 5.50am when two unmarked police cars and one armed police stood outside. ‘There were a few inside I assume and there was one around the back. I then heard the arrest take place as I had my ear pressed to the door. He later said: ‘Initially I just heard the banging. Sounded like someone trying to kick the door in, that’s what it sounded like to start with. And then I jumped out of bed, put my ear to the door, listened to what was going on. ‘Then I heard the police shouting, ‘put your hands up, turn around’, all that sort of thing and then it went quiet. Two police officers stood guard throughout the day yesterday at the entrance to the property where the arrest took place. 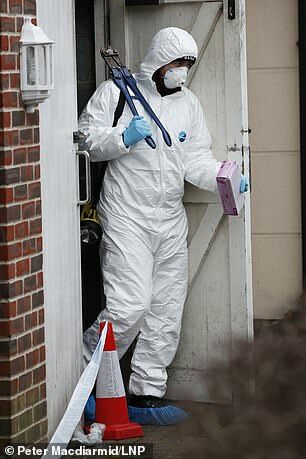 Estate agent Wendie Thompson, who lives nearby, expressed her shock at the incident and said police had continued to guard the flat. 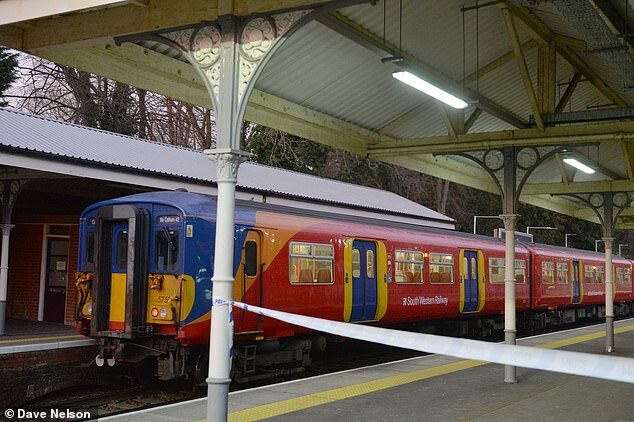 A female passenger on the train on Friday said ‘there was a lot of blood splattered everywhere in the carriage’. 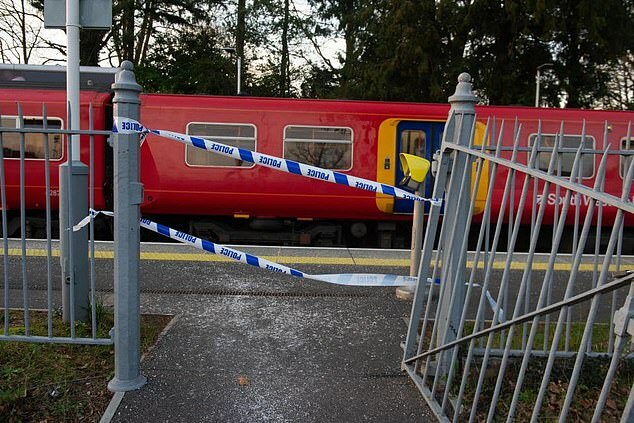 ‘The police who were here first started to give him CPR but it was apparently too late to save him and he died while the train was in the station,’ the witness added. 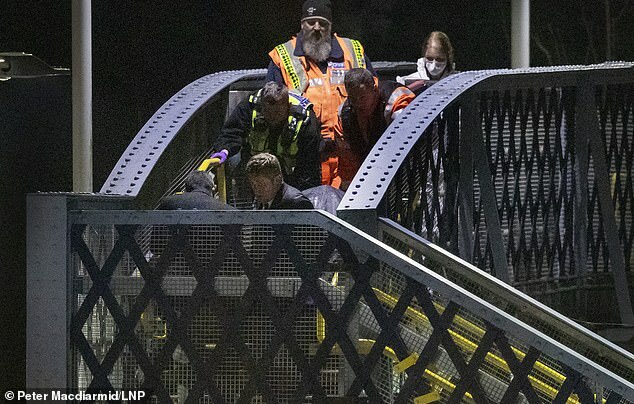 Other passengers said how the ticket inspector and driver leaped into action to desperately try and save the man before emergency services arrived. 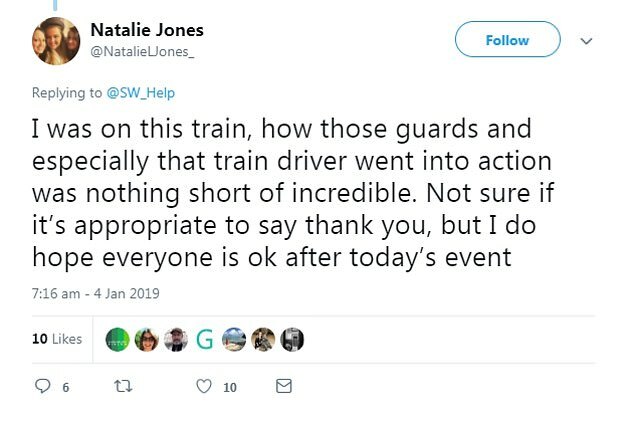 Another witness praised the efforts of the railway staff in the frenzied aftermath of the attack. 12.58pm- The South Western Train leaves Guildford, with London the final destination. 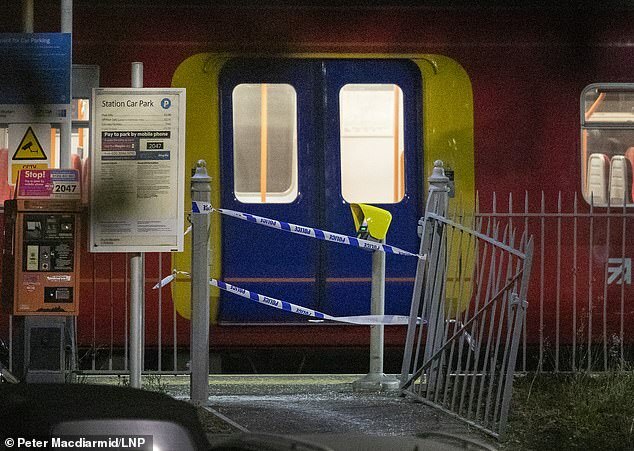 1.01pm- The victim, thought to be in his 50s, and attacker, board the train at London Road. 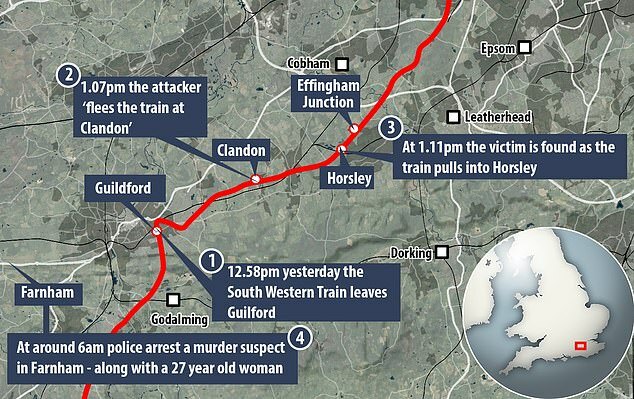 1.07pm- The attacker is thought to flee the train at Clandon. 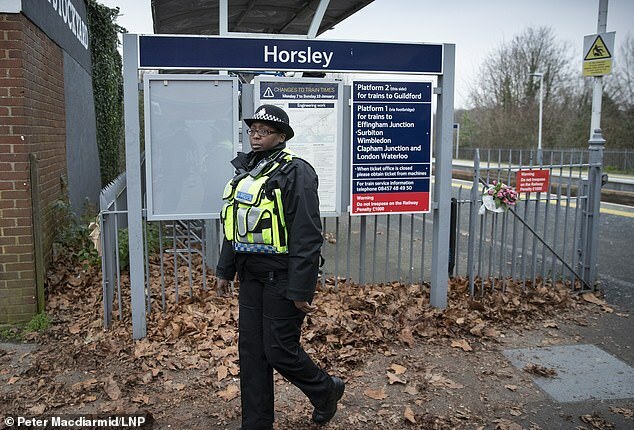 1.11pm- The victim is found as the train pulls into Horsley. 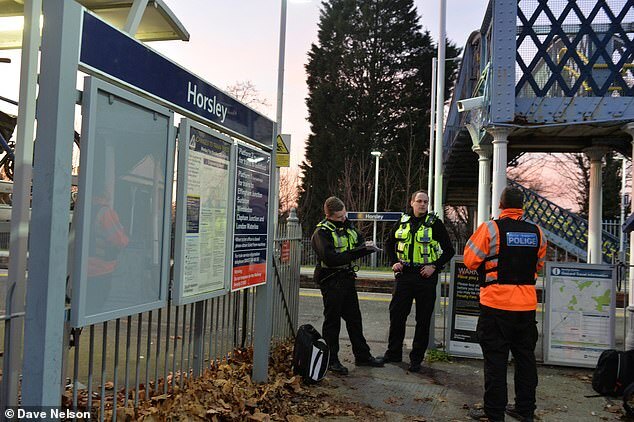 1.15pm- Police officers are called to the to Horsley station after reports a man has been stabbed. 6am – Murder suspect is detained at an address in the Farnham area. A 27-year-old woman was also arrested on suspicion of assisting an offender. 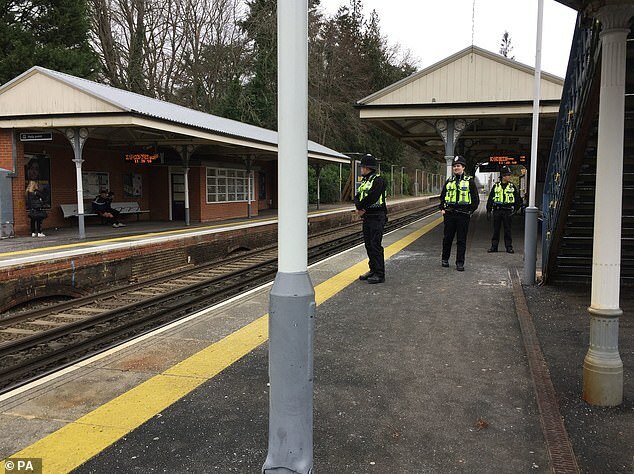 Oliver Thompson, a 16-year-old student living in Clandon, said he was stopped by police in the area at roughly 2.30pm and asked if he had seen a ‘man running from the station’. A little later he saw police helicopters circling the area before being joined by ‘a police van with high-powered lights’ as conditions darkened. ‘It comes as a big surprise as Clandon is a quiet area that you wouldn’t associate with crime like this,’ he said. 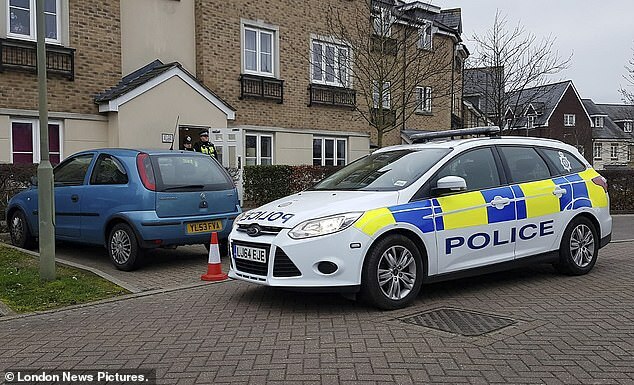 A Home Office pathologist was expected to carry out a post mortem examination on the man’s body to establish the exact cause of his death and the Surrey coroner was notified of the death. Last year was the capital’s deadliest since 2008 as London saw 134 people murdered in 2018. It’s a New Year and already a number of violent incidents have shocked the Capital. 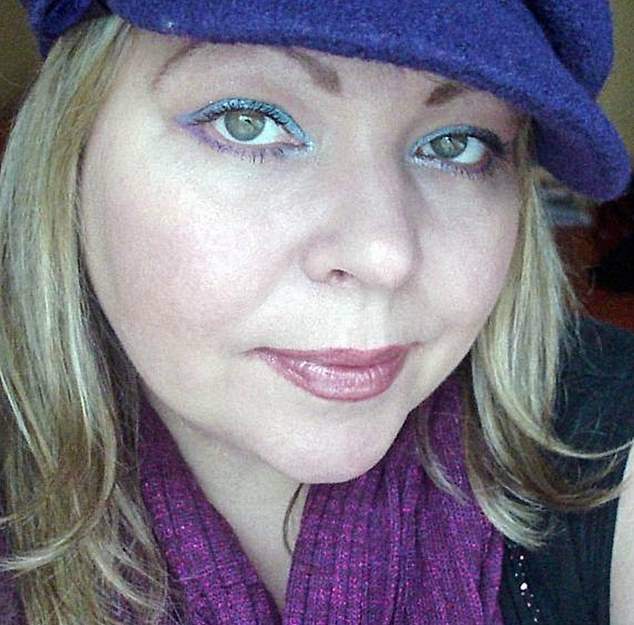 The first stab victim of New Year was named as 33-year-old mother Charlotte Huggins. She was stabbed to death at her home in Camberwell, south-east London, at 4.20am yesterday hours after wishing ‘all a happy new year’ on Facebook. 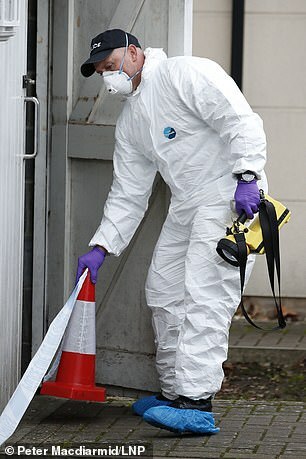 A doorman, Tudor Simionov, was found with stab injuries following the private party and pronounced dead at 6.05am. Two other security staff and a woman who came to the door were also stabbed, and taken to hospital with non-life threatening injuries. Elsewhere in Wild West Britain one woman in her 20s was shot at a nightclub in Dalston, East London, while a drunken thug in the West Midlands attacked a partygoer with a 2ft sword. In Essex, a youth was stabbed once in the stomach at Club 195 in Epping after being involved in ‘a verbal exchange’ with a group of men on the dancefloor. Nicole Kidman and her tea filter bag, Timothée Chalamet and her glitter harness, Julianne Moore and her bow on her back… Discover the worst looks of the 2019 Golden Globes night. Last year, almost all the actresses and actors had opted for black outfits to walk the red carpet of the Golden Globes 2018. A symbol of protest against sexual harassment in Hollywood and support for the “Time’s Up” project. Result: no eccentricity… and therefore, almost no look error. But for the 76th edition of the Golden Globes, on Sunday 6 January, the colour was back on the red carpet. As well as fashion faux-pas.